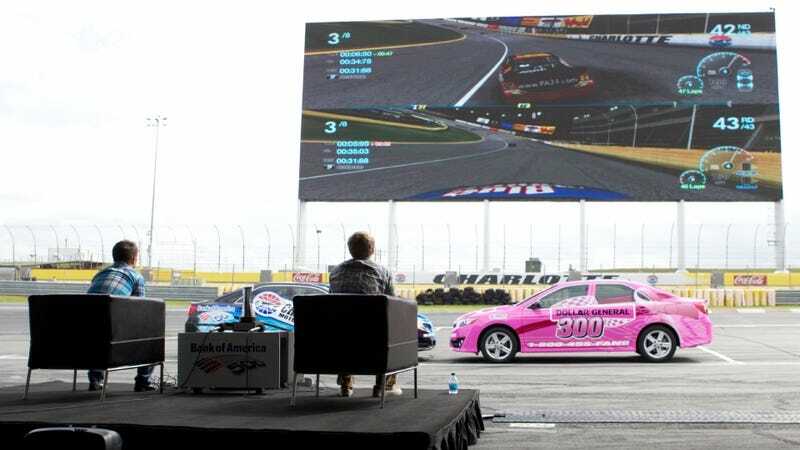 This Guy Played Video Games on the World's Largest High-Definition Screen. What'd You Do Today? Brad Keselowski, the current No. 1 driver in NASCAR's Sprint Cup series, and winner in two of its first three postseason Chase for the Cup events, met his match on Tuesday at Charlotte Motor Speedway in Concord, N.C. when Josh Bralley of Hickory, N.C. outgunned him to the finish in Activision's NASCAR The Game: Inside Line. The two dueled on the speedway's enormous high-definition video board, which at 200 feet wide by 80 feet tall, is currently the largest in the world, though some other screen is sure to take the title away soon. Bralley isn't a complete novice at racing nor a video game-only expert. He also drives a Chevy in the Limited Late Model division at Hickory Motor Speedway up 321 from Charlotte. Bralley finished ninth in the series this year. He beat seven other gamers in a preliminary series earlier in the day to win a shot at Keselowski. Keselowski, the current Sprint Cup points leader, presented Bralley with a trophy after suffering the loss. NASCAR's championship series movies to Talladega this weekend with Keselowski in front by five points over five-time series champion Jimmie Johnson. NASCAR the Game: Inside Line is on shelves Nov. 6 for PS3 and 360.